UIZ will assist you to collect, transfer, and process data compiled through the process of using the mobile survey app which you can use to personally survey your area. 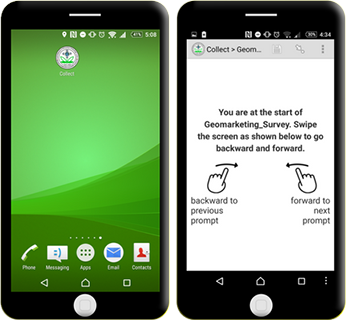 The mobile survey app could be used for baseline surveying, monitoring, and evaluation in addition to academic and field research along with your custom brand. Surveys can include text, numeric, and multiple-choice questions. Survey instruction can be in form of illustrations, audio and video instructions. The survey can record GPS coordinates, record audio, take pictures or video, scan barcodes, etc. Publish selected data directly to Google Spreadsheet, Google Fusion Tables, and Json Server. You can contact us at any time if you have any problems or needs. Feel free to contact us about your survey problems or needs by sending us an E-mail at info@uizentrum.de or call us at 030-20679113. If you already have your project requirements documented, please email us with your contact details and survey timeline. We will contact you with your mobile survey solution. We will work together with you on the survey form and app design in conjunction with your timeline and needs. We will design, develop and test the solution along with testing of survey forms, supporting datasets and export processes. We will train you and your team how to use the survey app, datasets, and export processes as per your project’s needs.